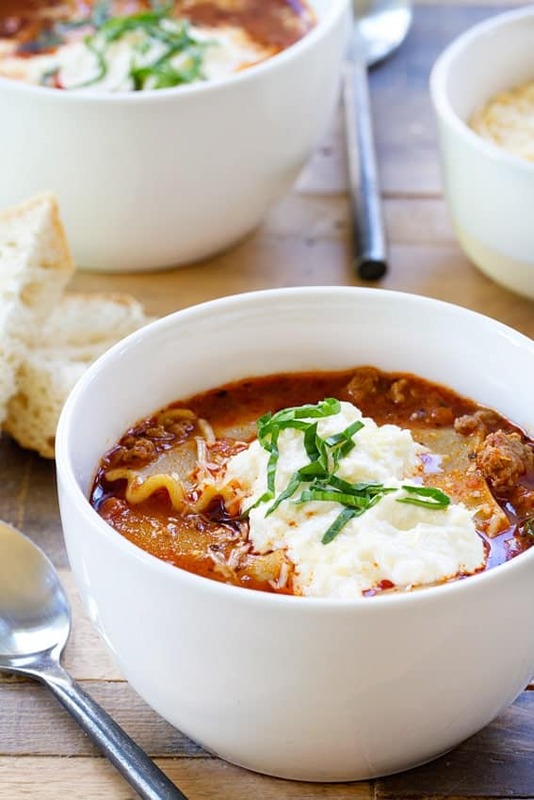 Lasagna soup is loaded with all the familiar flavors of lasagna in soup form. It’s hearty, delicious, and sure to become a new favorite. I normally don’t talk about current events here on My Baking Addiction because, well, this is a food blog. A place where lovely people come to find recipes for The Best Chocolate Cake, Pumpkin Roll and Cranberry Fluff – not to listen to me go off on random tangents about national news. And if I’m being honest, I kinda stay away from watching the news because it gives me all kinds of anxiety. If I’m aware of a current event, it’s probably because I came across it on social media. This week, my newsfeeds have been flooded with the controversy brewing over #Starbuck’s seasonal cups. All I’ve been seeing are hashtags – #StarbucksRedCup, #BoycottStarbucks, #Imneverbuyingcoffeefromstarbucksagain and I can’t even, so I’m bringing up a current event. Full disclosure here, I love Starbucks. I’m that person who will wait in the line wrapping around the building for a latte. And I’m fairly certain Eric thinks I have a bit of an unhealthy obsession with their iced black tea. However, even if Starbucks wasn’t one of my favorite things, I still wouldn’t grasp this whole situation. I mean, our nation is debating red cardboard cups that we sip deliciously festive coffee drinks from and then THROW AWAY. The cup is simple – plain even, I’ll give you that, but it’s pretty – it’s ombre, and I love me some ombre as one could deduce from my overgrown roots. If anything, this whole situation has given me a refresher course on what’s important during the holiday season. Hopefully folks will focus some of their energy on giving to those in need and sitting down to a hot meal with those they love and not dwell on coffee cup designs. I’m sorry, but if I’m searching for the true meaning of Christmas, I’m not looking for the answers on a cardboard cup brimming with a Caramel Brulée Latte. I’m just not. 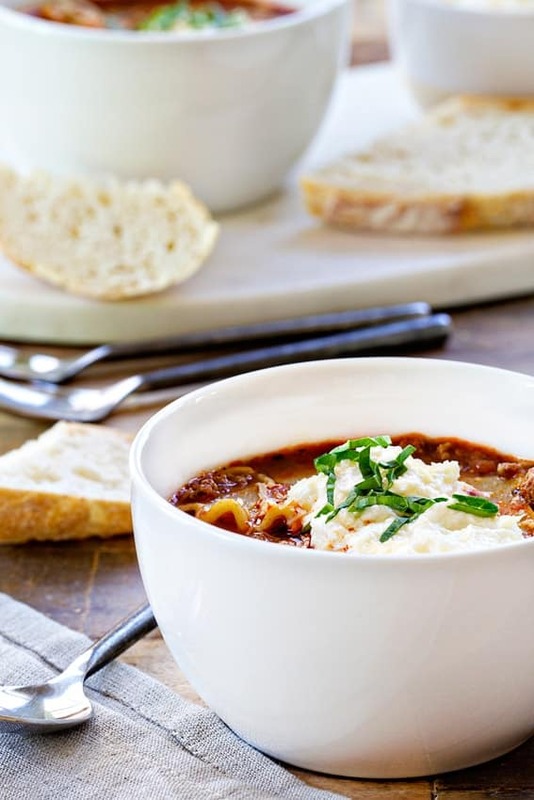 Obviously, this Lasagna Soup has absolutely nothing to do with with Starbucks or ombre red cups. However, it’s deliciously hearty and comes together in a snap. It’s the perfect cozy meal when paired with a fresh salad and warm baguette or dinner rolls. And the leftovers are even better! 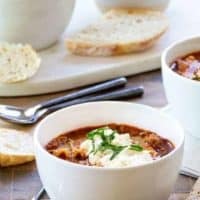 I hope you make this Lasagna Soup for your family and enjoy it together, around your table, because spending time with those you love is something that is truly important. Bring a large pot of salted water to a boil. Add the noodles and cook according to package directions. Drain; drizzle with olive oil and toss. Set aside. Meanwhile, heat 2 tablespoons olive oil in a large, heavy-bottomed pot over medium heat. Add the onion and cook, stirring constantly, until softened and translucent, about 4 minutes. Add the sausage, ground beef, garlic, oregano, red pepper flakes and salt and pepper. Cook over medium-high heat stirring and breaking up the meat with a wooden spoon, until it is nicely browned, about 7-10 minutes. Add the chicken broth, pasta sauce and 1 cup water; cover and bring to a simmer. Uncover and cook until slightly reduced, about 15 minutes. Stir in the noodles, basil, parmesan and heavy cream. Simmer for an additional 5-10 minutes. Feel free to adjust the spice to suite your taste. We added a little more oregano and red pepper flakes. and with you on this soup! Now, this is a brilliant idea for a soup! You nailed it on the head about what is truly important, especially around the holidays. 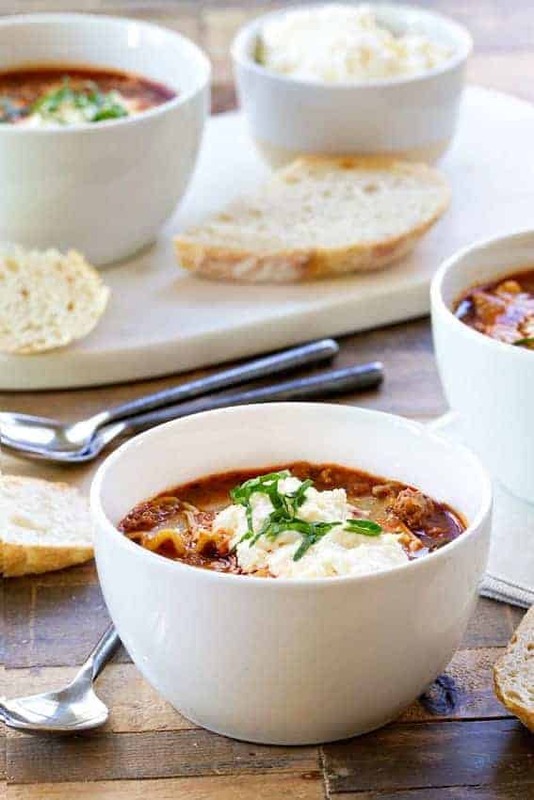 I’m sure my family would love to gather around the table together with a bowl of this cozy soup. This soup looks amazing! I have to make it soon! That’s my next soup! Definitely…just saying. As for the Starbucks controversy, if this is the worst problem we ever have, what’s the problem? We are just too spoiled! Think of the homeless, think of the Syrian refugees, think of the Brailizan rainforest, for Pete’s sake! Thank you, James! I’m glad you enjoyed it!